Over the next 30 days I’m going to be embarking on a scientific experiment, and the guinea pig is none other than yours truly! I know I have mentioned a little thing called ‘paleo’ on here recently but this is one step further and is known as the ‘Whole 30’. 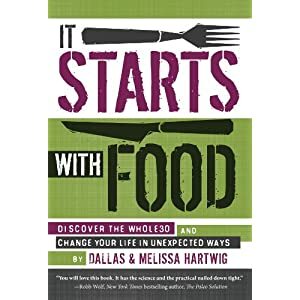 It’s based on the ideas of Dallas and Mellissa Hartwig, authors of the book ‘It starts with food’. The notion behind it is for 30 consecutive days, you cut out all gluten, dairy, grains, legumes, sugar, soy and alcohol, aiming to reset your body & your eating habits. After the 30 days you’ll start to reintroduce certain food groups, in order to see how these affect your bodies – whether or not they cause upset. This will help you to establish which foods you should keep in your diet and which you should probably lose for good. I’m also hoping the ‘diet’ (if that’s what you want to call it) will help to make food exciting again, since I can’t just grab the nearest convenience/junk food – or ‘food without breaks*’ as they like to call it in the book – I will have to get super creative with my meals (I’ve already completed day one and tried 2 brand new meals). So, I’m sure you are all wondering what it is that possessed me to go on such a restrictive ‘diet’. Well, firstly, it is only 30 days! It may not be sustainable over a long period of time but there’s no reason why any of us can’t keep it up for a mere 30 days – that chocolate cake can wait! Most importantly I’m giving this my best shot as I have in the past suffered from digestive problems. I’ve tried giving up the obvious Gluten and Dairy (maybe not as strict as I should have been) and even tried hypnotherapy for a short time but nothing has seemed to work so far; in other words… why not? Besides, I normally wouldn’t eat too differently, apart from the fact my breakfast would have generally been oatmeal as it is so simple & versatile and I would have snacked relentlessly throughout the day. The thing I’m actually anticipating to be the most difficult for me is making sure I do the reintroduction after the 30 days. The temptation to celebrate completing the 30 days with a quarter pounder and peanut butter cheesecake will be MASSIVE! But. I won’t let that bother me just yet. I’m just going to give this the best shot possible and I’m taking you on a ride with me. I’ll be posting all my meals in batches on here along with my ‘final thoughts’ on each day to let you know how I’m feeling. If at any point during my 30 days you feel I’ve inspired you enough to start your food journey then please let me know. I highly recommend buying and reading Dallas and Mellissa’s book first to give you the ins and outs. *Food without breaks – Food that generally has no nutritional value but tastes so good we lose control and can’t stop eating!